Takeshi “Beat” Kitano is somewhat of a Renaissance man. Working as a stand-up comedian, painter, singer, author, and poet, he found just enough time to write, direct, edit and star in this peculiar action movie from 1993. 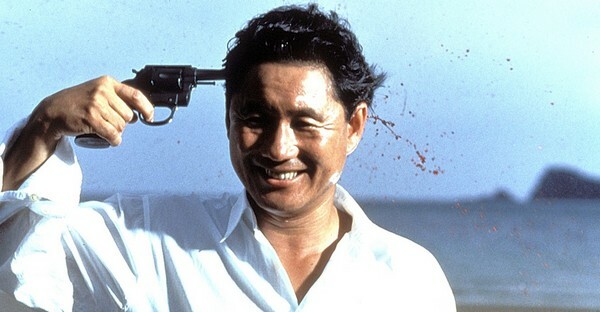 Sonatine is a languorous, but highly compelling tale about an aging yakuza named Aniki (Kitano himself). Sick of the loan shark game, he flirts with the notion of retirement, but not before he gets dragged into one last showdown. Ordered by his domineering boss, Aniki and his cohorts head to Okinawa to settle a turf war between two rival gangs. Getting caught in the cross fire, they escape and lay-low in a deserted cabin by the sea, waiting for either their next job or timely deaths. With such isolated portrayals of blood, mob shootouts and ultra violence, Kitano is able to generate tension vicariously through absurdist humour and overt serenity. As far as contracted thugs go, they’re a rather normal bunch. With Aniki, his two right hand men and a beautiful young woman at his side, they spend their time in-hiding digging sand dunes on the beach, laughing at sumo wrestlers and having idle small talk. Such comfortable characters makes the audience nervous. After all, this is an action movie, so things are bound to turn ugly. A looming menace permeates throughout Sonatine, with the responsibility lying primarily on Kitano’s own tattooed shoulders. An oddly humanistic angel of death, his impassive, beaten, yet charming face recalls Charles Bronson, only with the deadpan witticism of an archetype Aki Kaurismäki character. Narratively sweet and simple, Kitano is quick to bring up the ludicrousness of mob culture. Desperate to cut his losses and get out, Ankiri being dealt the death card would be a blessing rather than a tragedy. Far from glamorising the gun wielding and dirty money, the inspired filmmaker desensitises the life of crime and turns it into something far worse: tedious. If you like your action to be a brutal attack on the senses, it may not suit your needs. If you like classy filmmaking which deconstructs formalist genre boundaries, then it’s bout time you let Kitano into your life. This entry was posted in ★★★☆☆ (3) and tagged Action, Charles Bronson, Japanese cinema, Sonatine, Takeshi Kitano. Bookmark the permalink.